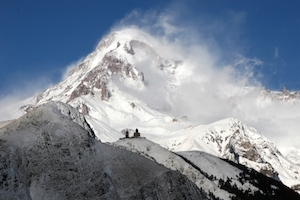 This is Post 3 (of 3) on the very special chant, shen khar venakhi (You are the vineyard). Post 1 contains the text, translation, and other useful background information. Post 2 pursues the topic of performing East Georgian variants of shen khar venakhi. 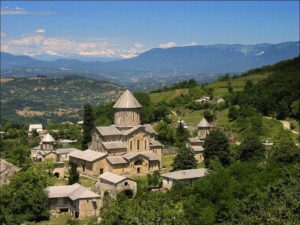 The West Georgian musical variants of the chant shen khar venakhi (You are the vineyard) deserve special attention. Because so many variants from the oral tradition exist --some five or six-- it offers a wonderful chance for comparison. Through such comparison, we can learn which features of the music were fixed in oral tradition versus which features were improvisational. There are at least seven musical variants inherited through oral tradition from West Georgia. These can be divided into two groups: those originating from chanters associated with the Gelati Monastery in central Georgia, and those originating from chanters associated with the Shemokmedi Monastery in the Gurian region in Southwest Georgia. 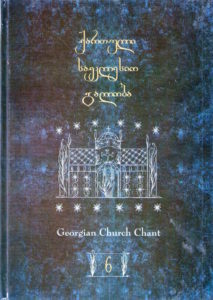 This chant book includes four musical variants of shen khar venakhi. 1) Traditional chant is almost always 3-voiced, not more not less. 2) Traditional chant is sung in "close harmony": the dissonances are integral to the desired sound. 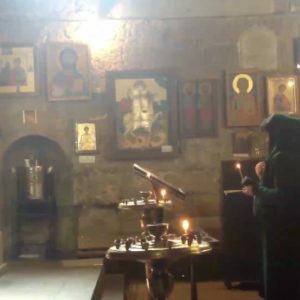 The tension-release in the music is symbolic of our prayers and supplications to God. 3) Traditional chants end in unison. 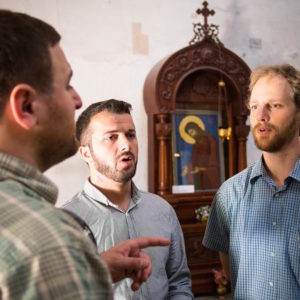 Many Georgian chanters will confide that like the Trinity, the three voices of Georgian chant come together as One, and that is the reason that most chants end in unison. 4) Traditional chant is organized around fixed model melody fragments that are sung in the top voice. To lose the model melody is to lose the chant, as the harmony is based on the melody. 5) Traditional chant follows strict conventions of harmonization. The lower voices harmonize the model melodies according to local aesthetic taste, developed and vetted through centuries of oral tradition. 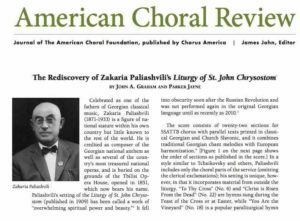 6) Traditional chant likewise follows strict conventions of ornamentation. By expanding the ornamentation with "foreign" flourishes, it loses the local character developed and vetted through centuries of oral tradition. 7) Traditional chant performance was a privilege, a guild. 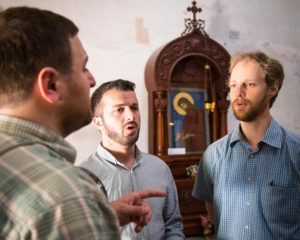 Master chanters trained for 5-6 years to attain proficiency in hundreds of model melodies, harmonization and ornamentation techniques, and the complex rubrics of the Orthodox rite. Thus, it is possible to imagine that upstart composers with a couple of years of Conservatory training, no matter how talented, were not immediately accepted members of the chanter's "guild." There are a number of ways to perform this chant. 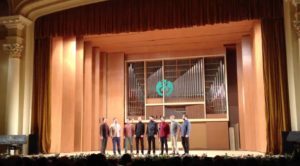 The Rustavi Ensemble popularized a "bel canto" or "academic" style during the decades of the 1960s-1980s. Other choirs have made different choices. The Anchiskhati Ensemble sings with a raw but refined thin timbre, similar to some traditional singers recorded in the early 20th century. 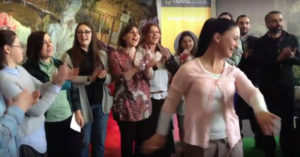 The Ialoni women's ensemble, a group of former Conservatory students, has a unique timbral approach to chant, which is much brighter than the dulcet tones of the Samtavro nun's choir, for example. As a choir director, one has to make choices between trying to preserve some "authentic" performance practice, and being realistic about the capabilities of one's choir members. Calling something "authentic" is of course problematic because there was so much variation even within the known traditional-singing community in the early 20th century. That disclaimer aside, here are some suggestions. - men, women, or children can sing, but it must be "close" harmony. Doubling at the octave is an imported musical feature. - timbre should be natural (tenors and sopranos in their mid-range, altos and basses in their mid-range). 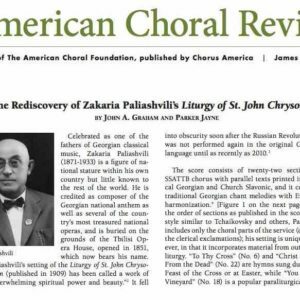 This is why most Georgian choirs, given the choice, elect to sing TTB, or SSA, rather than mixed gender choirs. - Voice crossings between the upper voice parts are common, as in all ornamental West Georgian chant. - the ornamentation techniques are similar to the ornamentation techniques employed to express local folk songs. 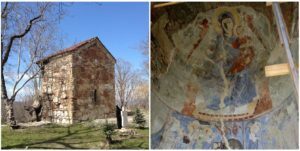 - the phrase structure of the West Georgian melodies is more complex than its East Georgian counterpart. They are also different melodies. The melodic phrases follow an order like this: ABC, ABC, Final phrase (where ABC are the three primary musical phrases of each verse). Phrase "A" is quite short, and serves as a clarion call. Phrases "B" and "C" are much longer. - Other texts are set to these very same model melody fragments. 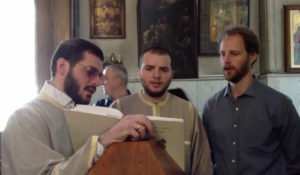 In the manuscripts, the West Georgian shen khar venakhi is often transcribed next to other chant texts associated with the liturgical ceremony of matrimony. These texts are set to the very same melodies, thus the music is not unique to the shen khar venakhi text. 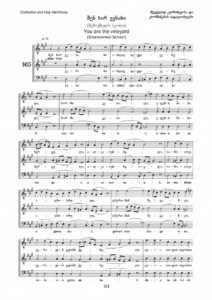 - The Gelati monastery variant is characterized by harmony including intervals of a third, fifth, and octave below the melody. 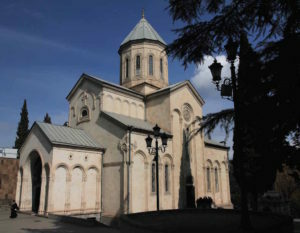 - The Patarava and Erkomaishvili variants, representing the Shemokmedi monastery tradition in the region of Guria, display different types of harmonic choices. In these variants, the lower voices typically harmonize the melody with intervals of a whole tone, fifth, octave, and ninth. 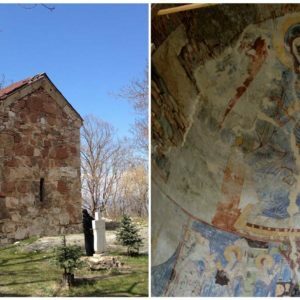 - The best advice here is to simultaneously listen to folk music from the Gurian region while listening to Gurian liturgical music. There is no legato, no sliding between notes. Every note is firmly placed in a precise place, like letters in a vertical row of mail slots. 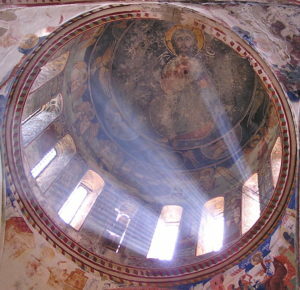 - There are voice-crossings in the West Georgian variants which provide an opportunity for the middle voice timbre to shine. 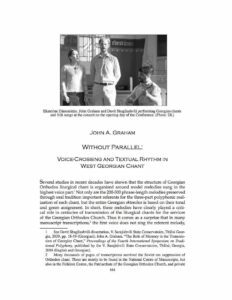 For more on voice-crossings, see the article: "Without Parallel: Voice-Crossing and Textual Rhythm in West Georgian Chant" (2013). 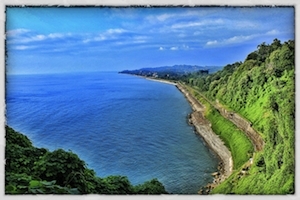 - There is a playfulness to West Georgian chant that must be discovered. 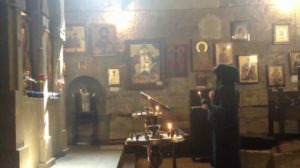 - There is less emphasis on the long sustained line in West Georgian chant (than its East Georgian counterparts), more interest in ornamenting a long note than holding it. 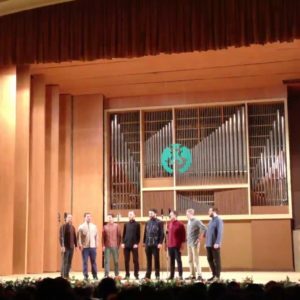 - It's rare nowadays to hear West Georgian variants performed with European choral technique, but it's entirely possible (the Rustavi Ensemble sang it that way in the Soviet era). 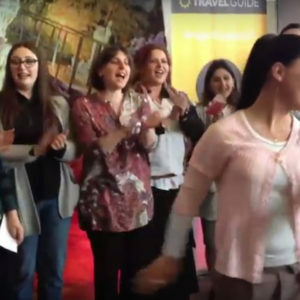 The Basiani Ensemble, for example, tends to sing the Erkomaishvili (West Georgian) variant in trio format, as they would sing ornamental Gurian regional folk songs.